Y'all remember this archetypical villain, right? 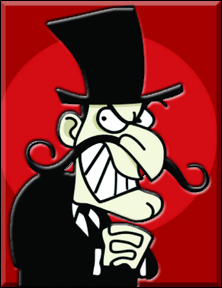 Snidely Whiplash, twirling his handlebar moustache and cackling maniacally as he planned deviously devilish plots that would make even The Simpsons' Mr. Burns faint due to their pure and unadulterated evil. Strangely enough, you may have noticed in recent years that it's become popular to portray Pastors & Theologians as the dastardly villains wreaking havoc on innocent Christians everywhere. 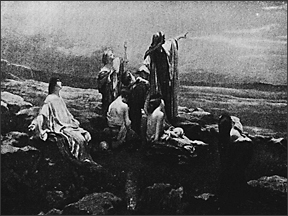 A few years ago, I was reading a book (representative of many, so I won't give the title lest it become a rabbit trail) that was attempting to prove that Old Testament Law was actually a blueprint that God had given us in order to "disciple nations". The author mentioned that they hadn't seen this truth for many years, because -- you guessed it -- "pastors and theologians" had deceived the author into only looking at the Old Testament through "Jesus lenses". The author was, in essence, blaming those dastardly pastors for telling the author to look for Jesus in the Old Testament, thereby deceiving people about the true intent of Sharia Old Testament Law. Imagine! Those sneaky, conniving, deceitful, dastardly pastors and theologians! 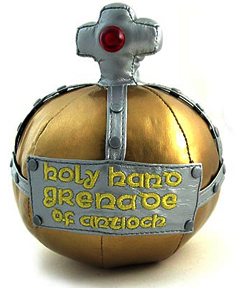 Where the Holy Hand Grenade do they get off, deceiving thousands upon thousands of unsuspecting Jesus-followers like that? Where on God's green earth did they ever come up with the lame-brained lie that the Old Testament points to Jesus? Oh yeah, that's right. They got the idea from Jesus. Those dastardly pastors and theologians, they were... you see, they were... agreeing with what Jesus said. After all, when anybody in the Gospels refers to "the Scriptures", they meant the Old Testament, because the New Testament hadn't been written yet. ... He was talking about the Old Testament. The Scriptures that pointed to Jesus. Oops. Turns out, those dastardly pastors and theologians may not be the real villains, after all. 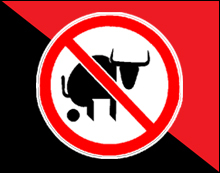 As I've written about before, when people -- speakers, writers, or bloggers -- adopt a methodology that mocks and dismisses anyone with theological understanding (including but not limited to pastors & theologians), it should immediately raise a Red Flag of Discernment in our minds. Sometimes, Snidely Whiplash disguises himself as one of the Good Guys In The White Hats. But if you pay attention, you may be able to discern a certain -- oh, how shall I say it? -- barnyard aroma. In the Old Testament, prophets had the unenviable position of telling people news that they usually didn't want to hear. And in many cases, "shoot the messenger" was the response they received, even if what they were saying really was what God wanted them to say. 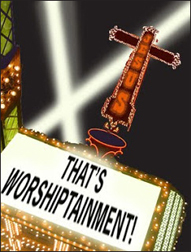 There is no shortage of people who have (often correctly, I'm sad to say) pointed out the shallowness, hypocrisy, and -- for lack of a better word -- corrupt aspects of Christians, churches and ministry organizations. Nobody with access to Google can deny that things are rotten in the state of Denmark. But here's where it gets weird: instead of calling people back to the roots of their faith (repentance), there is a thriving industry of writers, speakers, bloggers, and leaders who are using the sad state of affairs to encourage Christians to abandon their faith (or at the very least, quit church). That is a light-and-day reversal of the role of the prophet that we see in the Old Testament. They saw the corruption and called people to "come back". That is also a complete reversal to Jesus' own prophetic words in the letters to the seven churches in the book of Revelation. Six out of the seven churches received a strong word from Jesus (if I may broadly summarize) to "come back". Honestly, we don't need more "prophets" telling us that God wants to give people world-wide ministries, great wealth, or fame and fortune. Nor should we heed "prophets" who entice us to simply roll over and play dead, abandoning the faith (or wash our hands of "the church"). We need people who function like it says in Revelation 19:10: "it is the Spirit of prophecy who bears testimony to Jesus" -- in other words, prophets point people to Jesus. And in some cases, they call people back to Jesus.